The 80mm PWM model combines all of the above essential features. It provides maximum cooling airflow and operating noise levels down to a silent 19.2dB(A). The increased air pressure makes the fans especially recommended for use in water cooling and air cooling setups. • Very quiet operation even at maximum speed, with noise of 19.2dB. 80mm be quiet! 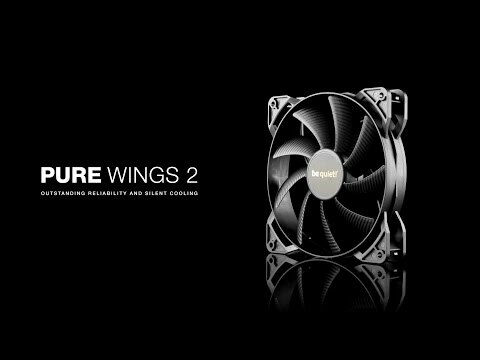 Pure Wings 2, 7 Blade, PWM, Airflow/Pressure Fan, 1900rpm, 26.3CFM, 19.2dB, Rifle Bearing, Black, 1x4-pin is rated 5.0 out of 5 by 3. Rated 5 out of 5 by Jimmy1989 from Great little fan Installed this to my PC because it was desperate for a second exhaust fan. The fan has helped keep its temperatures down and the fan itself has superb build quality. Rated 5 out of 5 by Headteacher from Nice fan does the job I needed it for, nice and quiet, delivery excellent from Scan/DPD which, if you are a regular customer you will know all about. Rated 5 out of 5 by Poprin from Superb little fan I have become increasingly impressed with BeQuiet! products and this is no exception. I have an ageing but still superb Silverstone LC04b HTPC case that I keep repeatedly compromising with components to keep using! I recently made some hardware changes and my new Asus A88XM-PLUS motherboard annoyingly does not seem to control the speed of three pin fans. I had viewed the existing Silverstone stock fan in the case as ample but running at 100% it was far from ideal. So I decided to purchase this fan, the specs sounded favourable and it has a 4-pin PWM connector. The fan arrived in a small and neat package, the fan itself looks very high quality and is well put together. I am a big fan of the whole aesthetic. Unfortunately it only arrived with 4x standard fan screws. I was hoping for some kind of rubber fitting to reduce vibration, fortunately I had one myself but be aware you will not find anything like that in the packaging. In short the fan does exactly what it says, it produces a strong air flow and does so very quietly... the only annoying thing is now it's quieter than my cooler and I'm gonna have to replace that now!! Does this fan come complete with fixing screws?